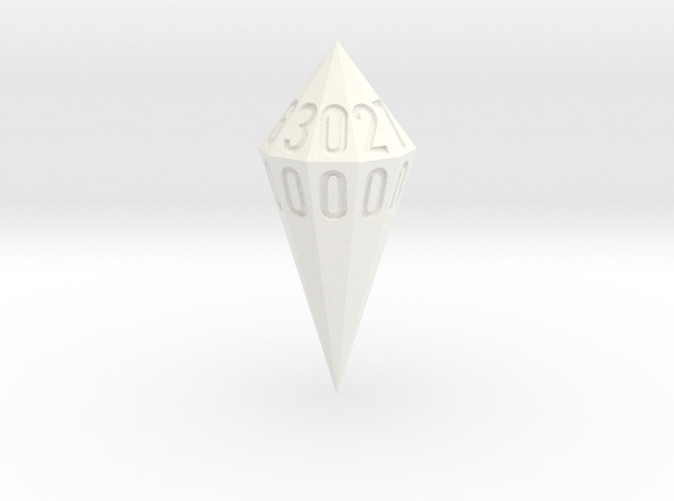 A three sided die in the shape of a partially elongated trigonal trapezohedron. Although this shape has six sides, it can only land on three. 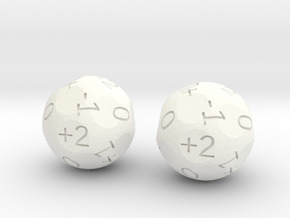 The opposite upfacing sides have been numbered 1 through 3 to serve as a three-sided die. A partially elongated Square Dipyramid numbered 1 through 4. 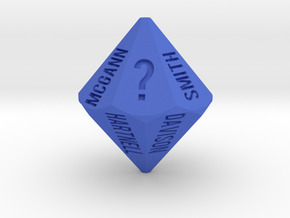 I also offer a five-sided version of this shape. A partially elongated Hexagonal Dipyramid numbered 1 through 6. 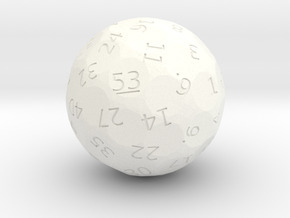 A partially elongated Octagonal Dipyramid numbered 1 through 8. A partially elongated Decagonal Dipyramid numbered 0 through 9. A partially elongated Decagonal Dipyramid numbered 00 through 90. A partially elongated Dodecagonal Dipyramid numbered 1 through 12. The convex envelope of a Decagonal Dipyramid numbered 1 through 20.